The Galaxy Tab 10.1 just looks a little too much like an iPad, at least according to Apple. And while appearances are everything a German court ruled yesterday that the design similarities aren't as blatant as Apple has claimed and allowed Samsung to continue to sell their modified Galaxy Tab in Germany until a final verdict is reached early next year. What finally turned the tide in Samsung's favour? Apparently the speakers have it. According to Lars from the Blog All About Samsung, who was present for the ruling, the judge decided to allow continued sales of the Samsung Galaxy Tab 10.1N due to the addition of small speakers on the front panel of the new Android tablet. While a minute alteration, it was apparently enough to get around Apples design from 05.25.2004 and save Samsung from a new sales ban. Granted this seems like splitting hairs, but as this patent war slowly spills over into a new year, I'll take any victory the Android community can get. 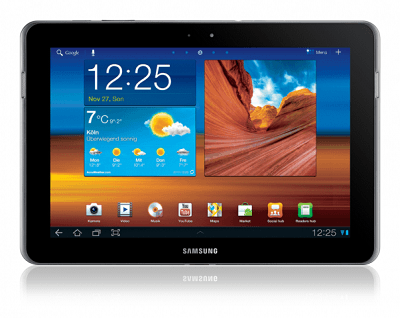 Final verdicts regarding the fate of the Galaxy Tab 10.1 and Galaxy Tab 10.1N are expected on January 31 and February 9 respectively with the fates of the entire Samsung Tablet series hanging in the balance. While the verdicts only carry weight in Germany, they establish precedence which can affect both future court cases and an eventual out of court deal, which seems to be where this is all leading to.